Although our trademark is single varietal releases, we still describe California wines in terms of French regions. Our Bordeaux-style blends are called Meritage and come mostly from the Napa Valley, our Burgundian wines from Sonoma, Santa Barbara and the Anderson Valley and, lately we have all discovered and hailed the great Rhone-style blends from Paso Robles. Last month, I got a taste of authenticity and some very good wine as we toured the Vacqueyras, Gigondas and the Chateaunef-du-Pape appellations in the Rhone Valley in southeast France. As a bit of perspective of the history of winemaking in this region, we tasted a red blend that the family called “1717” in honor of their first vintage, nearly 70 years before our Constitutional Congress. Heavily regulated by the “Appellation d’ origine controlee” (AOC), serving to support a high quality standard, the region permits the planting of only 13 varietals, regulates blend percentages in certain appellations and even the soil type in which each grape can be planted. The character of the Rhone Valley, steeped in centuries of fine wine making tradition, has not only passive charm; it’s the authentic passively charming place that we try hard to replicate in the U.S. wine regions. Although, everyone understands that the “mistral winds” are ever-present to provide some healthy stress to the tranquility. The blends differ from appellation to appellation in the Rhone Valley, but none step beyond the boundary of the permitted grapes that include mainly reds like Syrah, Grenache, Mourvedre, Cinsault, while Viognier, Marsanne, Rousanne and Grenache Blanc mostly represent the white varietals. The cooler northern Rhone sub-region produces only Syrah exclusively as a red wine and mostly Viognier as a single-varietal white. Experiencing a more Mediterranean climate, southern Rhone creates the famous blends, specifically regulated in each appellation. As for our experience, facing time constraints, my wife’s ongoing wish to visit Roman ruins and the need to explore as much as possible, an investment in some time efficiency was in order and we arranged for a small tour with a local company, http://www.provence-panorama.com, promoting a very personalized experience in three appellations: Vacqueyras, Gigondas and the king, or more appropriately, the Pope of all areas, Chateaunef-du-Pape “New Castle of the Pope.” History tells us that in 1308, the papacy was relocated to Avignon and the Popes soon fell in love with the local wines. One, John XXII, became specially enamoured with the area a was responsible for building the famous castle seen in photographs. Our chauffeur and local wine expert, Emily Molins, met us at the downtown Avignon Tourist Office, a few steps from our apartment and our adventure began with some history of the city before picking up Travis and Marion from Mercer Island, outside of Seattle and Greg and Trish, visiting from Melbourne. The small group had a healthy knowledge and appreciation of wine, all anticipating new discoveries as we left the Medieval-walled city and followed the mighty Rhone River up to Vacqueryras and our first estate. 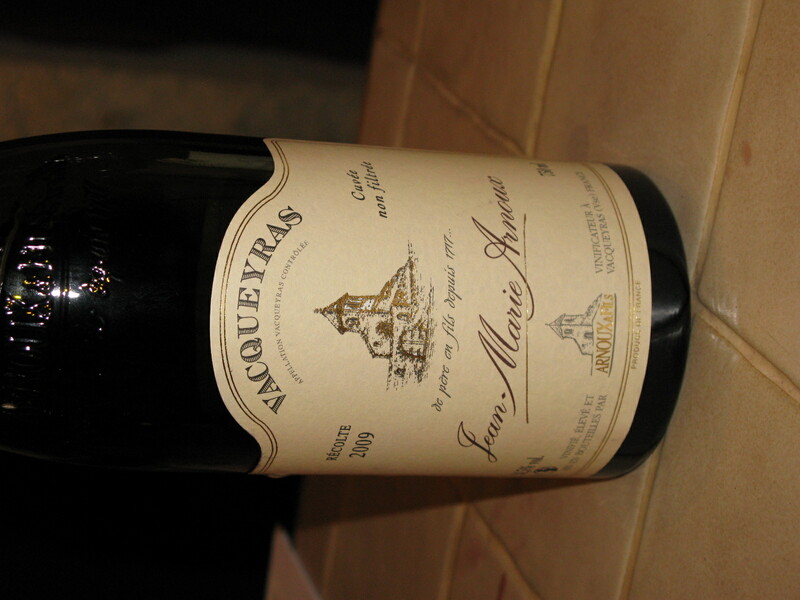 The Vacqueyras appellation, overshadowed by Chateaunef-du-Pape and even Gigondas, is known for powerful wines; the bulk of which are red blends featuring grenache, syrah, mourvedre, cinsault, muscardin and counoise. The area boasts 1,300 hectares (hectare=10,000 square metres) and a history beyond comprehension. Our first stop was the Vieux Clocher estate, operated by the Arnoux and Fils family and our first wine was a rare white blend of primarily grenache blanc and clairette. The French use stainless steel and not oak in the production of white wines. The result is a balanced citrus flavors following a nice bouquet of wild flowers on the nose. The flight of red blends began with the 2009 Vieux Clocher “Recolte”, a grenche/syrah/mourvedre blend that serves as their most accessible wine in both price and taste. This “collection” of certified Rhone grapes had an impressive nose and soft flavors soon to be overshadowed with escalated richness as we proceed up the flight to their premium wines. Old vines generally produce smaller yield and more concentrated, rich flavors, the reason we often see it promoted on many labels. The Vieux Clocher Vacqueyras Seigneur de Lauris 2005, awarded 90 points from Robert Parker, proved to be the steal of the day, expressing deep, rich flavors for about $20. Consistently compared to those produced by their neighbors, Gigondas and Chateaunef-du-Pape, I found, in this 70%grenache/30%syrah blend all the depth, balance, structure and flavor expected from wines twice the price. Although this wine can stand up to rack of lamb and other meats, we paired my bottle, later in the apartment, with an assortment of cheeses, meats, eggplant ragout, bread and some fine jazz piano. 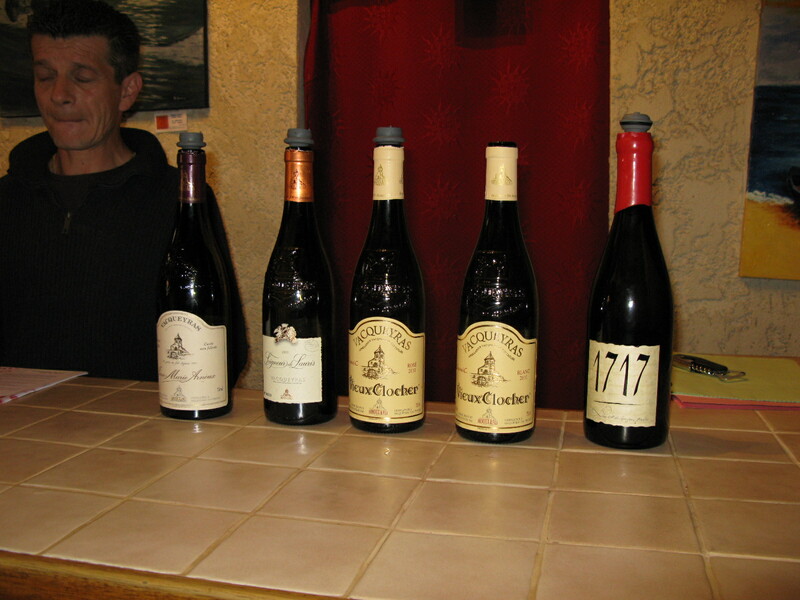 The tasting concluded with the very soft, complex Veiux Clocher Jean Marie Arnoux 2009 and the before mentioned “1717”, their top wine whose 3,500 annual bottles first spend 26 months in thirsty oak barrels. The “1717” was a classic Cotes de Rhone Cru, born from grenache, a personal favorite of all French grapes; bold but balanced. In the end, I could not pass up great quality at a value price and purchased a bottle of the “Seigneur de Lauris”. Believe me, if I could have determined a conveniently plan to transport it back to the States, I would have bought more. As the glasses were distributed, Emily commented on how rare it is for each guest to grasp it properly, by the stem. This is a group that knows what they’re doing and is ready to move deeper into the Rhone. The Gigondas appellation consists of 1,030 hectares and is unique in that no white grapes are permitted to be grown and the red blends, known for their boldness, all consist of 80% grenache, 15% syrah and 5% mourvedre. It was charming French countryside encased in vineyards and establishments such as Caveau des Gormets Restaurant Vignerum, who hosted hors’douves and some tastes of local vintages. The flight of wines, all very good; all very bold, were poured into black glasses, a tradition in blind tastings to disguise the age of the wine, lightening in color with time. Enjoying the atmosphere, we could have spent the afternoon on the patio. However, anticipation of visiting Chateaunef-du-Pape, the patriarch of all southern Rhone appellations, was overpowering and we were soon heading to our final destination. While the heritage of this wine region is entwined in 12th Century papal history, its winemakers uphold tradition while continuely evolve to meet the demands of global markets. Although the cultivation of all 13 grapes, is permitted, there is a definite trend to concentrate on the red blends that feature the multi-dimensional “terrior” of the appellation. A tasting at Ogier Depuis, founded in 1859, highlighted the impact of soil in creating distinctive wines. The soil has always been credited as a key component in the development of good Rhone blends. Ogier Depuis serves as an indoor, outdoor classroom allowing one to sensually experience it firsthand. The four distinct soils of the region were on full display in a small demonstration garden on the property, mostly “river rock” (60%) retaining the heat that allows Grenache to flourish. Poor draining “limestone” (20%), clay-based “sol” (15%) and red sandstone (5%) complete the “terrior” palate. Our flight of red blends to taste were specifically selected to feature the attributes of the dirt. But first, as I have learned from California Rhone-style winemakers, before focusing exclusively of reds, we must start with a white blend. Earning a 91 pt. 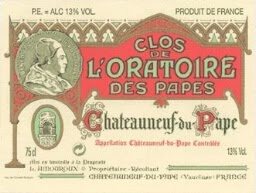 rating from Robert Parker, the Clos de l’Oratoire des Papea Chateaunef-du-Pape Blanc, from river rock soil, had multiple concentrated flavors of flowers, orchard fruit and melon, clearly of well-ripened stock. This wine would stand up well to chicken or fish. Our flight of vintage 2007 red blends from various “terrior” within the appellation opened the door to experiencing the “true” Rhone blend, beginning with the 2007 Galets Roules Caves du Pape. Representing the “river rock” soil type, the Terrior Galets Roules’ Caves du Pape was a soft, accessible wine, expressing very full nose and flavors. From the limestone soil “terrior,” the 2007 Terrior Eclats Calcaires Chateaunef-du-Pape, a very good wine, was fully ripened and jammy, benefitting from some daily heat. So highly concentrated, the 2007 Terrior Safres Chateaunef-du-Pape displayed a liquer-type intensity and richness to its flavors. By comparing differences, it was easy to celebrate the similarities in these wines: full flavor and nose, balance and richness. As always, there was one wine that caught my attention. My personal favorite of the Ogier Depuis tasting was the 2007 Ogier Caves des Papes Terrior Gres Rouges Chateaunef-du-Pape. After a very perfumed bouquet, expressed hints of smokey flavors blended with those of dark berry and fig. Well-rounded and highly concentrated, the velvety texture motivated my palate to “flag it” as the one. With many grapes to blend and many terrior to select from, a good question about their winemaking technique is “when to blend?” The answer is immediately prior to the aging process. They let them grow old together. Having recently acquired a bottle of a single-varietal 2009 Bonny Doon Cinsault, a consistently good Rhone blending partner, I inquired about its value. Apparently, it is very fragrant, dry with concentrated juice and usually pocesses a long soft finish. One can overlook the insignificant color and the lack of tannins for a long, soft finish. The qualities of our last wine, the 2007 Clos del Oratoire de Pape, has received attention of Robert Parker and Wine Spectator magazine who awarded it 91 points. Grenache-based with hints of Syrah, Mourvedre and Cinsault, this vintage was earthy and very fruit forward, concluding our tasting on a terrific note. A quick ride to the remains of the 14th Century castle gave us all, especially my wife, a historical perspective of the region, not to mention a panoramic view. As the sun faded, we were reminded, once again, that the “mistral winds” have a daily presence and impact to each vintage. Although we barely scratched the surface of all the great Rhone blends, the tour provided opportunities to view barrel rooms, visit with the winemakers and enjoy the fruits of their labor. 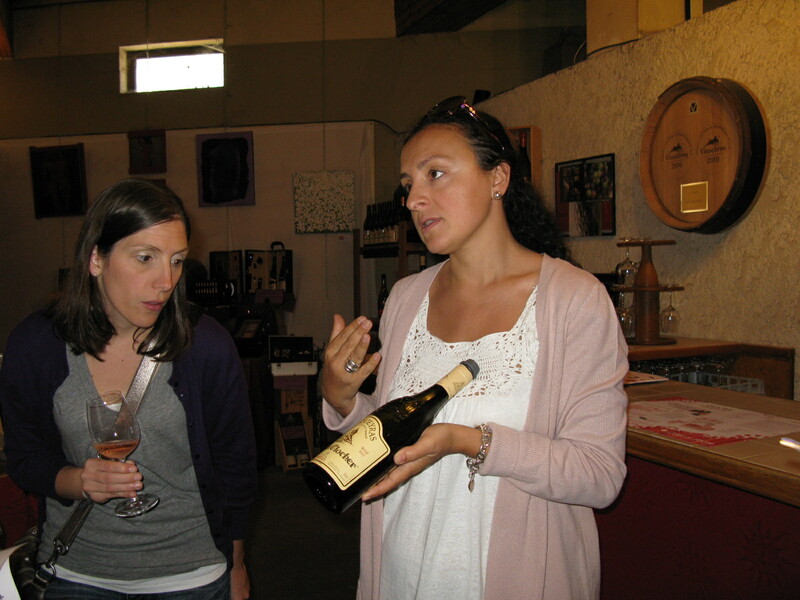 Our guide, Emily and her assistant,Erick, were very knowledgable, not only of the local area, but with fine wines of the world. Those interested can register at the Avignon Tourist Office or phone them direct at +33(0)4 90 29 76 05. This entry was posted on Tuesday, June 7th, 2011 at 1:35 am	and posted in Travel, Wine. You can follow any responses to this entry through the RSS 2.0 feed.